Decorations Lights for Halloween theme, Christmas theme, Birthday theme, Love theme, Female Theme, Children theme etc. Lights for Christmas/Halloween/Birthday/Party to create atmosphere instantly. They will make your party more interesting more characteristic! They do not need a plug, can be placed anywhere! Brings brightness, warmth and companion to kids,cute,safe Toy for baby or Kids. 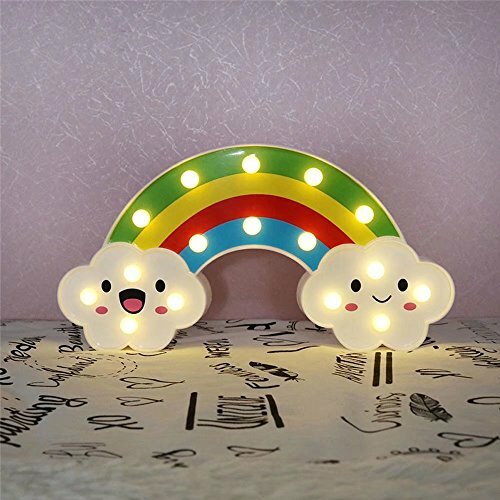 Night Light Decorative, Can be a friend in the house,Cute Gifts and Bring Warm to the Nursery or the Kids Room. Perfect Lighting Decoration for Party,living room, studies, dormitories, galleries,Christmas, weddings or birthday etc. SIZE:30cm(11.81"in) Length* 2.8(1.0"in)cm Wide* 16cm(6.29"in) High, measure by person, maby has 1-3 cm error. If you have any questions about this product by CSKB, contact us by completing and submitting the form below. If you are looking for a specif part number, please include it with your message.